One of the most effective techniques for saving decayed or injured teeth is the root canal treatment. Yet when many people hear they need it, they become nervous at the prospect. Much of this stems from a common misunderstanding that undergoing a root canal is painful. It’s not — today’s anesthetics are quite effective in numbing pain during a procedure, and mild pain relievers like ibuprofen are usually sufficient to manage any discomfort afterwards. In fact, a root canal treatment relieves pain caused by decay within a tooth. As decay progresses, it can enter the interior known as the pulp, which contains bundles of nerves and blood vessels. It attacks these nerves causing pain and infection. If the infection progresses through passageways known as root canals that are in the roots of the tooth, the pain can intensify. 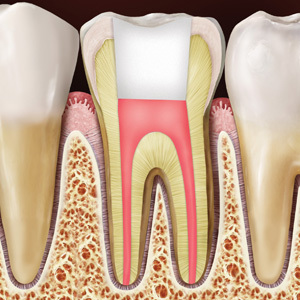 More important, the tooth is in danger of loss as the root and connective tissues that hold the tooth in place are injured from the spreading infection. During a root canal treatment, we access the pulp by drilling a small access hole, usually in the biting surface or in the rear of a front tooth. Once we enter the pulp chamber we remove all the contaminated tissue. Once thoroughly cleansed, we fill the empty chamber and canals with a special filling (usually gutta percha) to prevent future infection. The access hole is then sealed and at a subsequent visit we strongly recommend placing a permanent crown to provide further protection from damage to the tooth. Root canal treatments are quite common. All general dentists have been trained in endodontic treatment and can perform most types of procedures. More difficult cases (like a complex root canal network that may be hard to access) may require the services of an endodontist, a specialist in root canals. Endodontists use advanced techniques and specialized microscopic equipment to treat complicated situations. It’s actually good news if we recommend you undergo a root canal treatment — it means your tooth has a good chance of survival once it’s disinfected and the decay is removed. But don’t delay: the sooner we can treat your tooth, the better your chances of a healthy outcome.